Not just your family. Your friends, neighbors, co-workers, and customers. Give them a $3,700 pay hike - every year! Vote YES on 1! 1. Ending the income tax will give back $3,700 average, each to 3,400,000 Massachusetts workers and taxpayers. Not just once. Every year. This tax cut is a $3,700 a year pay raise for you and your neighbors. 2. It will take $12.5 billion out of the hands of Big Government and put it back into the hands of the men and women who earned it. 3. 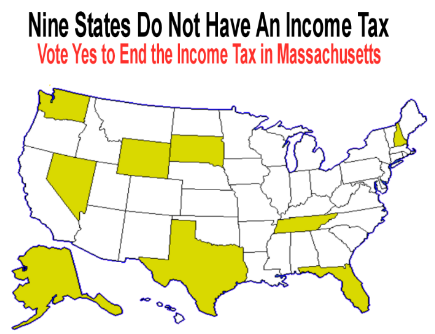 Ending the income tax will create hundreds of thousands of new jobs in Massachusetts. 4. It will force the state legislature to streamline and cut government waste. 5. It will force the state legislature to get rid of failed, flawed Big Government programs that don’t work and that make things worse. 6. Ending the income tax will make the legislature accountable to workers and taxpayers – instead of government employees, lobbyists and special interests who profit from high government spending. 7. It will allow Massachusetts to become a magnet to productive businesses and individuals. 8. It will help millions of families to pay for the rising cost of gas, food, and heating oil and to pay off credit cards, school loans, and other debt. It will save thousands of families from home foreclosure and bankruptcy. 9. By making the Massachusetts tax burden more affordable, more of our young people will be able to stay in Massachusetts near their family, friends, and homes. Your neighbors, your friends, your family need YOU to vote YES on 1 to END the Income Tax. Vote YES on 1 this November 4th. Alaska, Florida, New Hampshire, Nevada, South Dakota, Tennesse, Texas, Washington, and Wyoming. Let's add Massachusetts to the list! Vote Yes on Question 1. * Wall Street Journal: "Boston Tax Party"
* Boston Herald - Howie Carr: "Two Americas: One gets zilch and the other filches"
* NY Times - "Massachusetts Proposal Would Repeal Income Tax"